IT seems strange to be writing about a Vauxhall Astra with 237bhp, but these days a figure like this is almost de rigueur for any car with serious sporting pretensions. And Vauxhall’s Astra VXR has plenty of this, shouting aggression from every gaping air intake and mesh grille. It’s the embodiment of the firm’s push to be taken seriously as a sporty car maker, and follows on the heels of the even more extreme VXR220 roadster and the bruising Australian-sourced Monaro VXR with its 6.0-litre V8 engine. Compared to these two, the Astra version seems almost sensible, what with its roomy boot, practical three-door hatchback body and a 2.0-litre turbocharged engine. Except that it’s not. In fact, it’s far from sensible – it’s a bit of an animal with its ‘out of my way’ looks, whistling turbo soundtrack and 150mph-plus top speed. This car shouts its sporting ambition at every opportunity. Fortunately, it backs up its boasting with a great drive. That 237bhp figure propels the Astra to the top of the superhatch league, eclipsing the 222bhp of the Ford Focus ST and Renault Magane 225, and annihilating the Volkswagen Golf GTI’s 197bhp. It’s also a lot more extreme to drive. ‘Single-minded’ seems a relatively flat way to describe the VXR, but that’s what it is – designed to be driven hard, and to reward that commitment with fantastic handling, acceleration and braking performance. User-choosers will be a key target for this car, especially with its sub-£19,000 price tag. But unless your staff take their driving seriously, it’s probably better to direct them towards one of the rivals mentioned earlier as they’re far more forgiving to drive and strike a better balance between performance and comfort. For those drivers who are up for the challenge, they will enjoy the feeling of taking it by the horns and revelling in a car designed to behave in a way which matches its aggressive looks. Because make no mistake, this Astra VXR is unlike any other Astra. Its immense acceleration is accompanied by an equally impressive display of torque steer, with the front wheels diving about as they try to deploy 237bhp to the road. The ride is hard, cabin noise is high and the steering is ultra-direct. There’s also a strange whistling noise as the turbo spools up. It feels too forced, too unnatural; as though it has been added in by someone in marketing who has spent too long playing Gran Turismo on their Playstation. On the plus side, the car looks fantastic, the interior is well screwed together, the list of standard equipment is high and the Recaro front seats are fantastic, clamping you in place between their generous side bolsters. And then there’s the price – the Astra VXR costs £18,995, undercutting the Golf GTI by £1,000 and the Renault by around £500. Only the Focus ST-2 undercuts it, costing £500 less. It seems Vauxhall has created something of a performance bargain. FORD has stolen a march on its rivals in this burgeoning ‘super-hatch’ sector by pricing its new Focus ST from £17,495 for the basic three-door model. However, we’ve opted to test the car in middle specification ST-2 trim, which costs £18,495 but is still the cheapest car of our quartet. Vauxhall’s Astra VXR costs £500 more, which leaves both well ahead of the Renault and Volkswagen, with the Megane 225 priced at £19,500 and the Golf GTI just £5 shy of £20,000. DESPITE the highly-tuned nature of its engine, the Astra VXR doesn’t need any specialist treatment. 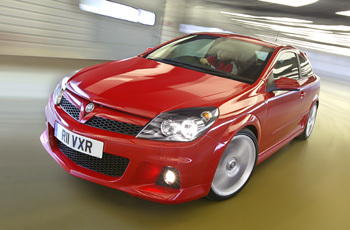 Instead, just like any Astra, all the VXR needs is a 20,000-mile healthcheck and a 40,000-mile service. This makes servicing, maintenenace and repair costs very economical over three years and 60,000 miles. The Renault is well off the pace of the rest, perhaps a legacy of the many electrical problems which have afflicted certain Renault models in the recent past. WITH its turbocharged FSI engine, the Volkswagen is the most fuel efficient car, returning a claimed average of 34.9mpg. As a result, it will cost a fleet £7,146 in unleaded over three years/60,000 miles. The Renault is the next most efficient, returning 32.1mpg for a cost of £7,770. The Ford and Vauxhall will cost £8,208. However, it’s highly unlikely your drivers will match these figures – after all, who chooses a car like this and drives along at a steady 56mph? Expect mid to high-20s mpg for estimating your fuel spend. WITH the lowest front-end price and the second highest residual value forecast from CAP (38%), the Focus is the best car for avoiding depreciation. The Golf GTI is second, despite it being the most expensive car to buy. However, its class-leading RV prediction of 42% sees it claw back lost ground. CAP estimates that the Astra VXR will retain 34% of its cost new, while the Renault’s challenge is blunted by a high purchase price and the lowest RV of just 31%. JUST a penny per mile separates the Volkswagen and Ford and this is solely down to the Golf’s better fuel economy performance. The Ford edges it in depreciation costs but it’s not enough to challenge the Golf’s winning position. The Vauxhall is third, 2.5 pence per mile more expensive to run than the Volkswagen. The Renault is a distant fourth, not helped by poor performances in depreciation and SMR costs. ALTHOUGH the Volkswagen is the most expensive car at the front end, it offers drivers the cheapest company car tax bills thanks to its lower emissions. A 22% taxpayer would pay £91 a month to drive the Golf GTI, £8 a month less than the next cheapest car, Renault’s Megane 225. The Vauxhall Astra VXR and Ford Focus ST both fall into the 31% benefit-in-kind band, resulting in monthly bills of £107 and £104 respectively. All four cars incur a VED bill of £165 a year. THe decision here comes down to two cars – the Vauxhall Astra VXR and the Volkswagen Golf GTI. For sheer driving enjoyment, looks and raw performance, nothing can touch the Astra – to be honest, it’s a bit mental. For those drivers who want a car which is easier to live with day-in, day-out, the Golf is hard to beat. It’s also the cheapest to run and offers drivers the lowest company car tax bills.